NGC 5256 is a pair of galaxies in its final stage of merging. It was previously observed by Hubble as part of a collection of 59 images of merging galaxies, released on Hubble’s 18th anniversary on 24 April 2008. The new data make the gas and dust being whirled around inside and outside the galaxy more visible than ever before. A riot of colour and light dances through this peculiarly shaped galaxy, NGC 5256. Its smoke-like plumes are flung out in all directions and the bright core illuminates the chaotic regions of gas and dust swirling through the galaxy’s centre. 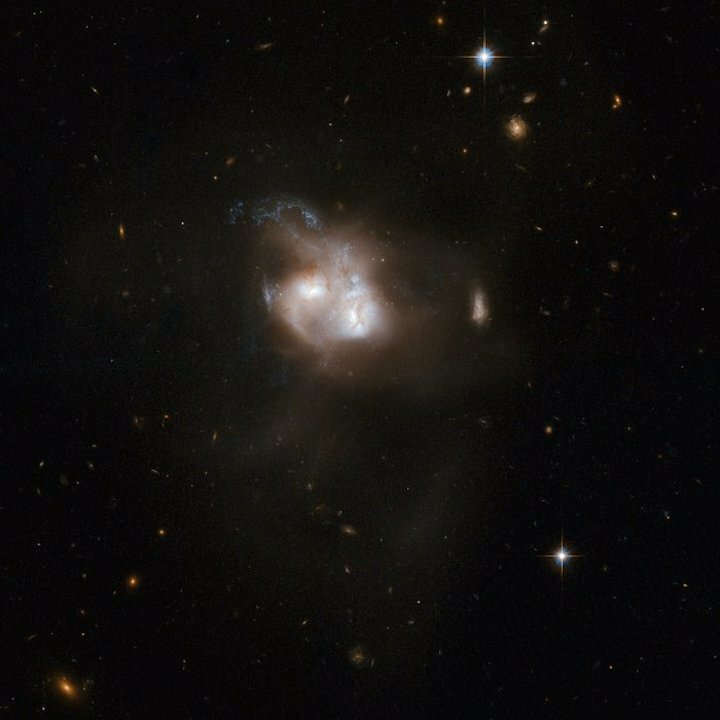 Its odd structure is due to the fact that this is not one galaxy, but two — in the process of a galactic collision. NGC 5256, also known as Markarian 266, is about 350 million light-years away from Earth, in the constellation of Ursa Major (The Great Bear) . It is composed of two disc galaxies whose nuclei are currently just 13 000 light-years apart. Their constituent gas, dust, and stars are swirling together in a vigorous cosmic blender, igniting newborn stars in bright star formation regions across the galaxy. 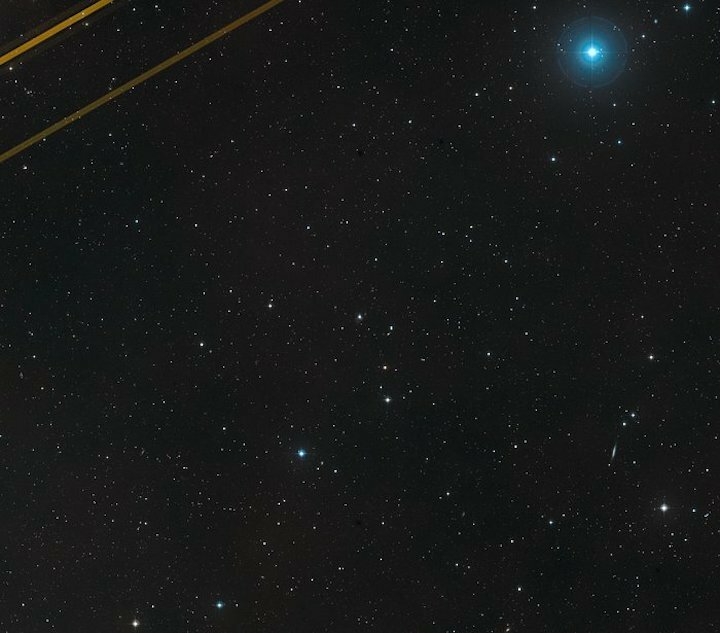 While these interactions are destructive on a galactic scale, stars very rarely collide with each other in this process because the distances between them are so vast. 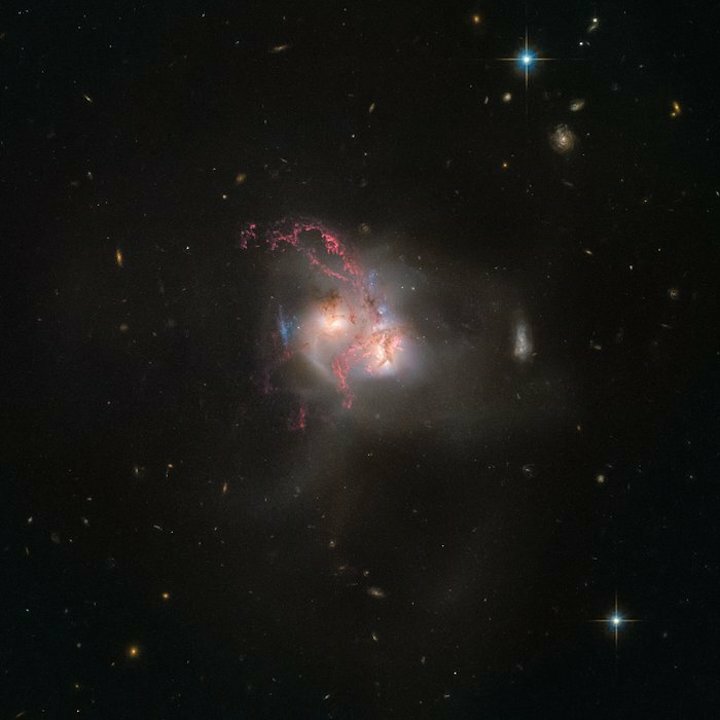 But as the galaxies entangle themselves, strong tidal effects produce new structures — like the chaotic-looking plumes of NGC 5256 — before settling into a stable arrangement after millions of years. In addition to the bright and chaotic features, each merging galaxy of NGC 5256 contains an active galactic nucleus, where gas and other debris are fed into a hungry supermassive black hole. Observations from NASA’s Chandra X-ray Observatory show that both of these nuclei — and the region of hot gas between them — have been heated by shock waves created as gas clouds collide at high velocities. Also in this Hubble image is another pair of probably interacting galaxies — they are hiding to the right of NGC 5256 in the far distance, and have not yet been explored by any astronomer. From our perspective here on Earth, NGC 5256 is also just a few degrees away from another famous pair of interacting galaxies, Messier 51, which was observed by Hubble in 2005 (heic0506). NGC 5256 has previously been imaged by Hubble as part of a collection of 59 images of merging galaxies, released on Hubble’s 18th anniversary on 24 April 2008. This new image adds H-alpha data taken from the Wide-Field Camera 3 to the previously available data, making the gas visible. This wide-field image shows the pair of galaxies known as NGC 5256 and their surroundings as seen from the ground. In the upper left corner two planes crossed the image. Due to the long exposure their position lights cause long streaks in the final image. NGC 5256, also known as Markarian 266, is a striking example of two disc galaxies that are about to merge. Spectacular streamers of gas surround the two nuclei and eye-catching blue spiral trails indicate recent star formation. The shape of the object is highly disturbed and observations in various wavelength regimes - infrared, millimetre-wave and radio - provide additional evidence for a starburst in this system. NGC 5256 is located in the constellation of Ursa Major, the Great Bear, some 350 million light-years from Earth. Each galaxy also contains an active galactic nucleus, evidence that the chaos is allowing gas to fall into the regions around central black holes as well as feeding starbursts. Recent observations from the Chandra X-ray Observatory show that both nuclei, as well as a region of hot gas in between them, have been heated by the shock waves driven as gas clouds at high velocities collide.